Today's OD tells us that 21 acres of the SUNYIT campus are being transferred to NY Office of General Services for a State Data Center. Is this the "Consolation Prize" for not getting the Chip Fab? Will this reduce the suitability of the Marcy Chip Fab Site? Will it eliminate Marcy as a back up site for the AMD Chip Plant? These questions remain unanswered. In the meantime, the State of New York has become a slum lord in West Utica. If the State is unwilling to develop "brownfields," how could it expect anyone else to do so? Its approach appears to be to abandon old facilities and build on virgin land. This is bad public policy, particularly in cities such as Utica where entire neighborhoods are affected. Another facet of this story: What are the site selection criteria? Why the big secret? At this point given the waste of public property going on in west Utica, the people are entitled to know. Perhaps the state is only doing its project on the cheap (like the homeland security facility at the County Airport) to pay a political debt . . . and everyone knows it's more expensive to build on a brownfield than virgin territory. The Global Warming story out of California that we blogged about last week got us wondering about what has been going on with the Regional Greenhouse Gas Initiative (RGGI or "ReGGIe"), a plan by northeastern states to reduce carbon dioxide emissions to help combat global warming. The answer is that plenty has been going on. A Memorandum of Understanding between the signatory states was released 12/20/05 and amended 8/8/06. A 163 page Model Rule was released 8/15/06. New York State DEC just announced that New York will propose a draft regulation this fall. So, it appears that the Northeast is well on its way to bringing itself into allignment with those countries who signed on to the Kyoto Protocol even though the US as a whole has not. What does RGGI have to do with Kudzu? If you remember Kudzu, planting of the vine was encouraged to control erosion. It did that very well ... In fact, it did that too well. The vine grew like crazy and became a problem itself, choking out beneficial vegetation and, basically, coverning everything, including entire buildings. Kudzu illustrates the "Law of Unintended Consequences" (or LUC): An action intended to solve one problem creates a host of unforseen effects. Bad LUC happens when someone concentrates so hard on the solution of a problem that potential negative effects of a different nature go totally unnoticed. We fear that will be the case with RGGI. First of all, Faultlines is skeptical that RGGI, even if combined with a fully implemented Kyoto Protocol, has any potential to significantly alleviate global warming. While anthropogenic global warming appears to be taken as "gospel" by many scientists and politicians, there are a number of professionals who feel that the theories are not sound enough upon which to base public policy. Assuming for the sake of argument that RGGI will contribute to solving the global warming "problem," what other effects will RGGI create? The fact is, we don't know because it has not been studied. The National Environmental Policy Act and the New York State Environmental Quality Review Act were intended to avoid unintended consequences by requiring a thorough study of impacts before actions (including policy making in NY) are taken. We've searched all over and have yet to find an environmental impact statement for RGGI. So we don't know what the unintended consequences of RGGI might be. We suspect that the RGGI carbon cap-and-trade system will hasten the abandonnment of fossil-fuel fired generating plants Downstate, increasing the need to "import" "clean" energy from or through other areas SUCH AS UPSTATE. Will Upstaters really care that the world's temperature is .0001 degree cooler when their landscape gets covered with windmills and powerlines to feed the Downstate market? We don't think so. RGGI was the brainchild of Gov. Patacki, someone who is interested in higher office and might want to appear "green" for a national audience. We don't think RGGI has been adequately thought through . . . Neither does Massachusetts nor Rhode Island which opted out of the agreement. Before any further action is taken to implement RGGI, an Environmental Impact Statement needs to be developed that examines, among other things, how Upstate NY will be impacted. "We just don't have any money. I don't have enough"
"We just don't have any money. I don't have enough," said Utica School Supt. Skermont. Global Warming Grandstanding . . . Yesterday California's Attorney General, Bill Lockyer, announced that the state has filed suit against 6 US and Japanese car makers for contributing to global warming. "Vehicle emissions are the single most rapidly growing source of the carbon emissions contributing to global warming, yet the federal government and automakers have refused to act. "It is time to hold these companies responsible for their contribution to this crisis," he said." The questionable science (and questionable law) behind this aside, isn't California employing a double standard? What state is more emblematic of America's love affair with the internal combustion engine than California? What state other than California is synonymous with the word "freeway?" Indeed, would California have grown to its present population were it not for the automobile? California could have opted for a vast European style of public transportation so people would not have to rely upon automobiles, but, as a matter of state public policy, it opted for a vast highway network instead. [As a side note York Staters had an interesting piece over the summer comparing public transportation in Syracuse with Bilbao.] California has an ability to control where urban development takes place and the density of that development. It could have adopted regulations requiring a more European pattern of land use, but it instead opted for sprawl, either intentionally or laissez-faire, which pretty much requires people to have their own vehicles. Given all the opportunities California has to directly and indirectly control the use of automobiles, given all the policy choices California has made to encourage and practically mandate the use of automobiles, California is far more responsible for its global warming predicament than the automakers it is suing. Something is rotten in Denmark ... er, New Hartford, when the Town Board dissolves the citizens budget review panel on the heels of denying the Observer-Dispatch copies of preliminary budget drafts. ""My philosophy is, citizens don't have all the information we have," Reed said. " You're darn right, Mr. Reed, you've done a great job keeping public information secret. Mr. Reed's tenure seems to be bringing more citizen exclusion from public information: The town's assessment roles have been removed from the town website (all the harder to see which residents are getting "favored treatment" from their town). The current and past Town Budgets have been removed from the website. The Town's controversial agreement with Prestwick Glen has also been removed. (The elite who run our community apparently don't want their tax-free-retirement-at-everyone-else's-expense status to shine in the light of public scrutiny). Mr. Reed seems to have learned this lesson well: If you can control the information available to the public, you can control the public. A trend is emerging, and it's not a good one. 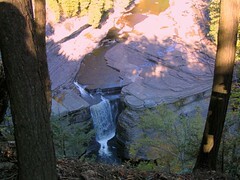 After being excluded from public access for almost a century, a Greater Utica Treasure, Trenton Falls, was opened to the public as of a couple years ago for two weekends in the fall and two in the spring. 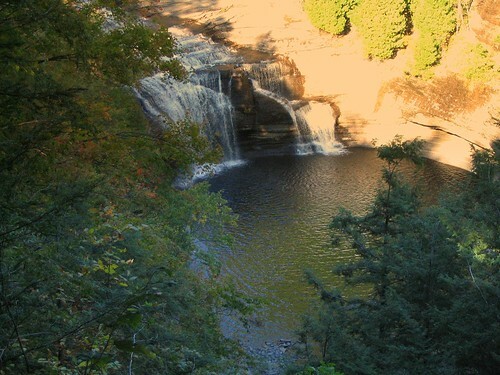 It will be open again October 7 & 8, and 14 & 15 for Fall 2006. This makes a terrific autumn afternoon walk. More info on the opening is available from the Town of Trenton. 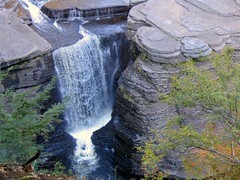 For our friends who searched on "Fault Lines" looking for geological information, here is a Trenton Falls Geology link that might interest you. There may indeed be some reason why the New Hartford Town Board is keeping a lid on their information. The Chief Mole at CNY Underground ferrets it out! “We have been unwilling to make the tough decisions necessary to make this area grow. This is most evident in our failure to embrace consolidation. . . .
What the writer refuses to recognize is that there is a strong perception that EDGE primarly works for Rome’s benefit rather than the region as a whole. Mayor Julian has complained about it. Herkimer County has complained about it. It has to be a strong perception when Sen. Hillary Clinton, who doesn’t normally concern herself with local politics, picked up on it. Other “consolidation” programs are perceived similarly. In this region, “consolidation” is perceived as taking from one community to give to another, with the decisions of who wins and who loses left to an elite group of insiders. For that reason, consolidation a/k/a “regionalization” will never be embraced, and SHOULD NOT BE. Fault Lines has previously blogged about this issue on several occasions. How regionalization/consolidation in the form of the Part-County Sewer District benefits New Hartford at the expense of surrounding municipalities is discussed here and here. How regionalization of the water system/auditorium/Utica Youth Bureau benefitted suburban areas at the expense of Utica is discussed here. Fault Lines discussed “consolidation” in an historical context, contrasted “metro-government” with regionalization, and explained the difference between “sprawl” and “growth“. “Consolidation” should be strictly limited to those things where one community will not sense it is being taken advantage of to benefit another: eg., centralized purchasing, perhaps. Before trying to consolidate further, elimination of overlap by different levels of government should be studied first. By “elimination of overlap” we mean situations such as Utica and the Villages where their residents pay for their local police departments and also have to pay for the County Sheriff to provide the same service to outlying areas. It’s even worse in the Villages where Town police departments also have to be paid for (i.e., villagers pay for 3 levels of local police protection (Village, Town, County), but actually only receive protection from one: the village). In this way, the true cost of providing services to particular locations will become known. Obviously, persons living in outlying areas would incur much higher costs for services because there would be fewer people to pay for them. Perhaps with this realization, the process of real, meaningful and wanted consolidation may begin. The ultimate answer is not consolidation of services across municipal boundaries, but MERGER of municipalities and ELIMINATION of the boundaries. If people in different localities are expected to share in the costs of services, they should also share in the benefits, and the decisionmaking. This can only happen with merger. New Hartford Town Secrecy . . . Here we go again . . . Only this time it's the New Hartford Town Board which is in the process of putting together its 2007 budget and publicly discussed it for the first time at a special meeting yesterday. "The board refused to supply the Observer-Dispatch with copies of preliminary budget sheets, which members referenced throughout the public meeting." Why not? Is the board afraid of being second-guessed? Is there something in the details they don't want us to see? "New Hartford resident Ed Blask said he had "complete confidence" the board will try to make the budget as cost effective as possible." It's nice that Mr. Blask has confidence in the Town Board, but one has to wonder what it is based upon. Does he have inside information? Is he friends with someone on the board? The statement marginalizes anyone who questionsthe workings of the Town Board. Keeping things secret does not inspire confidence. "It was not a lack of preparation on the school district's part." ... So said Utica Schools Supt. Skermont in today's OD in reference to the scheduling fiasco at Proctor High that was reported in yesterday's OD. WOW . . . Since the school district is responsible for properly preparing the student's schedules, how can Skermont claim that "it was not a lack of preparation"? Obviously, a lack of preparation is exactly what it was. Ms. Skermont's remark reeks of denial. Perhaps Ms. Skermont's administrators were too busy being shuffled around for them to do what had to be done. Rocco Longo, Interim Director of Secondary Education only began working at Proctor a few days before school started. Only a week ago we first heard about Steve Falchi leaving the Academy of Business and Finance to become principal of the Ninth Grade. Just yesterday we first heard about Academies "A,""B,""C," and "D" with one principal serving two academies. It seems like Ms. Skermont's administrators were so busy playing musical chairs that no one noticed the 'little detail' of the students' schedules. "Christine Golden, vice president of secondary education for the district and a Proctor global studies teacher, said district staff is doing all it can to correct the computer and schedule problems. "The kids are getting the classes that they need, it's just slow-going," Golden said." How can Ms. Golden say that when kids are missing core classes? The school's attitude is that the missed classes are not important. "Richardson called Proctor to find out how Basia could get caught up, she said. She was told Basia wouldn't be required to make up any assignments that she missed, she said. Ms. Richardson was not concerned about her daughter having to make up missed assignments; she was concerned about her daughter learning the missed material. Apparently, Proctor administrators are more concerned about bean-counting than learning. Therefore, it comes as no surprise that Proctor High is listed as one in the state needing improvement. Something is seriously wrong at Proctor, has been for some time, and will be for time to come until significant changes are made in school management. The school district can no longer hide behind the cloak of secrecy. Parents, students, and taxpayers deserve answers on how this snafu and the school's general lack of achievement happened. The Board needs to get to the bottom of this publicly. Some heads need to roll ... Is the Board up to it?